The University of Melbourne took up the challenge of teaching synthetic biology to all ages, embracing a ‘science for everyone’ approach. In so doing, we engaged in education outreach activities with kindergarten students from three childcare centres as well as both university and high school students from across Australia. Children aged 4-6 are in a key learning stage, during which their interest in science can significantly influence their long-term science education outcomes (Bowman, Donovan, & Burns, 2001, pp. 8-9). There are lots of resources about science for older kids but not so many for kids at such a young age. After we successfully published our book, it was time to take it to the audience. 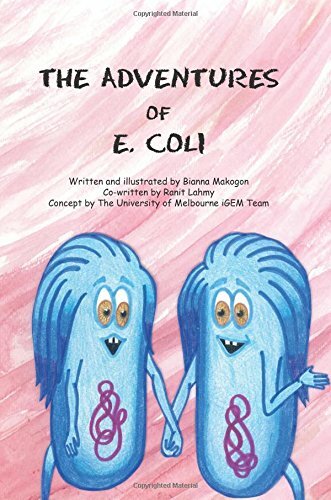 We approached childcare centres across Melbourne and negotiated for our book to be read to pre-schoolers and for our team members to come along and teach the kids about science. A big thanks to Kids Time Early Learning Centre (Moorabbin), Kids Time Early Learning Centre (Bentleigh East) and Coco's Early Learning Centre for inviting us to present our picture book to the kids. We believe that through this book, young children can learn about basic concepts and the language of biology, forming a scientific foundation to be built on in future years. Moreover, it is our hope that this book will inspire children to continue to learn about science and to appreciate all the wonders that it holds. To find a well-resourced, private high school to partner with an iGEM team (e.g. UoM) to field a team consisting of half private high school students/half underrepresented students – who would have their flights to Boston funded by fundraising done primarily by the private high school. After extensive email & phone correspondence spanning several months, the school decided it was not currently in the position to go ahead with the iGEM team proposal due to upcoming infrastructure developments, though would be interested in fielding a team after these are completed (scheduled for 2016). Nonetheless, the school did encourage us that other APS schools would likely be interested in hearing about iGEM and our team concept. Whilst we didn’t achieve our ultimate goal, this activity did raise awareness of the iGEM competition with all the key science staff members at the school which requested not to be named on this wiki (for further details please contact our team leader Sean). increase the participation of Australian/international high school students in the iGEM competition. In addition to our negotiations with the private high school, we also aimed at widening the participation of high school students in the iGEM competition by collaborating with the University of Sydney on The Strange Nature Writing competition. Furthermore, we wrote and published articles on Comet.is which is aimed at high school students, university students and recent university graduates, please see 'For university students' for a list of the articles we wrote. Our main form of outreach toward university students was in writing and publishing articles on a burgeoning and government sponsored website Comet.is which is aimed at high school students, university students and recent graduates. Our articles covered a range of topics from our iGEM experience to considerations of ethical issues of synthetic biology and the potential of synthetic biology. "All this leads me to refer to synthetic biology as a ménage Ã trois of a discipline, utilizing engineering, biology and computer science to produce a fantastically creative activity." "Given assistance in the form of grants or human resources, entrepreneurial forums along with student competitions like InnovationACT and iGEM have the chance to inspire entrepreneurialism in students. It is in these opportunities for students to go on entrepreneurial adventures, replete with late nights, red bulls and a shot at winning a grand prize – that the next generation of entrepreneurs is born." "A prime example of this is in the International Genetically Engineered Machine (iGEM) competition, which I am a team member of for the University of Melbourne this year. Our team stretches across many disciplines; from telecommunications and business to chemical engineering and science communication, even information technology - we are practically the UN of fields and backgrounds." "Participating in IGEM can definitely be categorized as having an experience and not just joining a team. The competition brings together all the components of completing a project for undergraduate students to be part of, a little like a trial run of a Masters or Doctorate course." Furthermore, as part of our outreach directed at university students, we combined our recruitment campaign for an IT whiz to help with our wiki, with a presentation on what iGEM was all about. 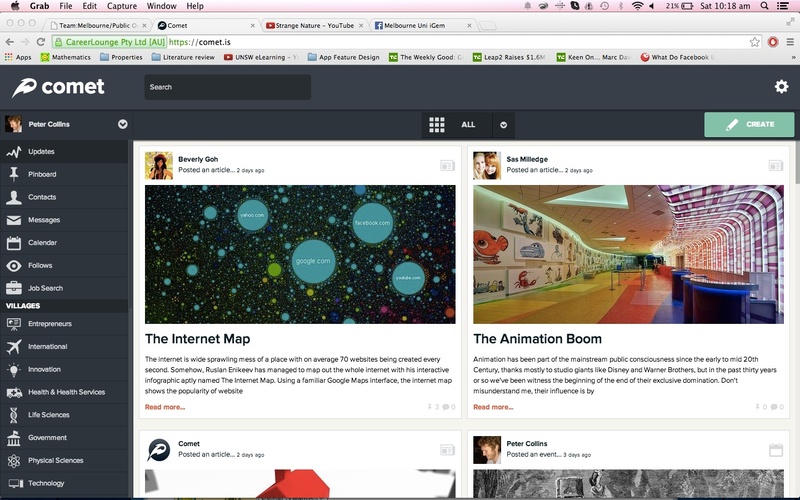 We lecture bashed over several weeks, presenting over 11 times. After promoting the iGEM competition to the Victorian State Chair of National Science Week (NSW) - Nick Besley, our team decided to field a stall in ‘Market of the Mind’ – a NSW event aimed at the general public located in a high foot traffic area alongside the Yarra River in Southbank across the river from Flinders St Station. 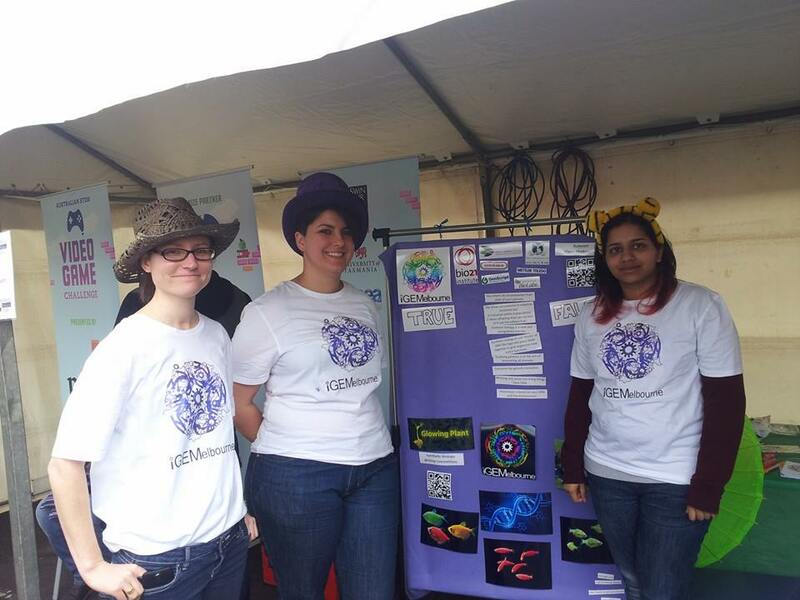 Luckily, our stall was located next to the bar, which meant there was a lot of foot traffic directed to our happy team members wearing our iGEM team t-shirts. Our team considered the question of ‘how should we proceed if we want to retain IP rights on our project’? Before attempting to answer this pertinent IP question, our team leader decided to recruit two more team members who had some intellectual property experience to complement the learning on patent law that a few early team members had acquired in their biotechnology undergraduate degrees. Both the new team members had previously filed provisional patents; one had filed some in Russia and the other in Australia, offering two perspectives on this question of IP. In answering this question, we approached our universities’ tech transfer office to gain clarity over our team’s discussions and brainstorm sessions on whether our project was patentable. The tech transfer office advised us that our project may have commercial applications, however it was probably too soon to act on the idea and convert it into a provisional patent, so we decided to hold off and wait till we had a more substantiated grasp on our commercial applications. We were also advised that if at any point we wanted to file for IP protection on the project, it would be really important to not have disclosed the details of our idea to anyone else, as this could result in us losing the right to our IP. After doing some research on the various law firms who could offer us a provisional patent, we discovered the estimated cost would be in the vicinity of $3500-$6500 depending on the level of detail we wanted to cover e.g. the number and extent of the claims, the full description of the idea, diagrams and experimental protocols as well as the filing & service fees associated. Due to the relatively high estimates we received, we looked into other options for filing a provisional, including recruiting a law student to join the team and contribute their knowledge to our IP protection. This avenue did not eventuate as our ideas on what we would like to patent continuously evolved over the course of the project and we could not reach a sufficient degree of clarity to bring on a lawyer for the filing of a provisional patent. Nonetheless, we proceeded with caution, ensuring to follow the advice of the University of Melbourne’s tech transfer office and not disclose our ideas without ensuring our disclosure was protected. An instance when we had to implement this protection was during our scientific collaboration with Oxford, were we ensured Non Disclosure Agreements were signed prior to the disclosure of our project to them. They indicated their interest in using our project as a case study in their ‘iGEM intellectual property guide’, however we felt that this might put our IP rights in jeopardy, so we decided not to proceed as a case study. At this time, our team is looking to produce at least one provisional patent following the iGEM 2014 competition on at least one of the various techniques we designed during the project. Bowman, Barbara T, Suzanne Donovan, and M. Susan Burns. 2001. Eager To Learn. Washington, DC: National Academy Press. IP Australia., 2014. 'Experimental Use Exemption From Patent Infringement | IP Australia'.Ipaustralia.Gov.Au. http://www.ipaustralia.gov.au/about-us/ip-legislation/ip-legislation-changes/ip-laws-amendment-act-2012/factsheet-experimental-use/.